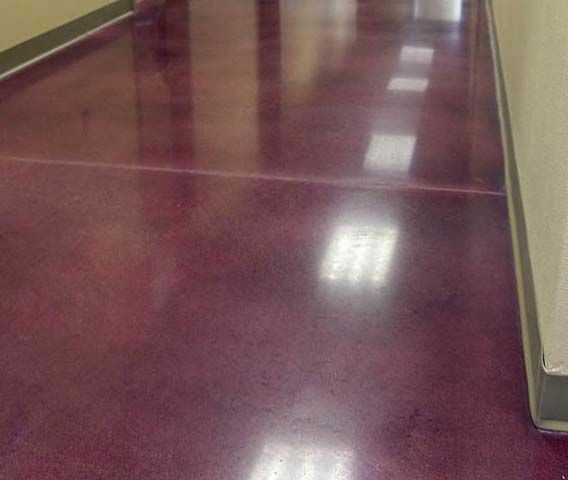 Unique Touch Concrete Design offers a variety of staining concrete applications for commercial, industrial and residential floors. Staining concrete in Toronto is a popular way to finish and enhance an ordinary new or old concrete floor, it provides a unique and very attractive finish, requiring very minimal maintenance and it can be applied to almost every commercial, industrial or residential concrete floor. 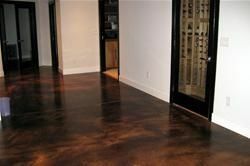 Many retailers and business offices are also choosing staining concrete for their choice of floor finish. The process of staining concrete consists in applying a colour dye mixture or a water based eco-stain that will penetrate the concrete. Each concrete slab will accept the stain mixture in different ways of intensity and variations that will create a natural distinctive look to every floor. Sealer is then applied over the stain to protect it. Because staining concrete is a penetrating process, it will naturally change the colour of the concrete and will not fade or peel off like some other types of flooring paint. More and more designers, architects, business and home owners are choosing staining concrete as their finished floor of choice. Homeowners who have concrete floor condos or basements are essentially sitting on a goldmine. Realtor surveys show that finishing a basement ranks just behind kitchen and bathroom renovations in maximizing the return on the homeowner’s investment, with the payback sometimes exceeding the remodeling expenditure. What’s more, expanding the living space into the basement is often much more economical than adding another room or floor onto an existing home. Please give us a call or send your questions and we will be pleased to help you and provide a free estimate. Unique Touch Concrete Design is fully equipped to conquer any small or large commercial or residential project in this industry in a professional and timely manner. Copyright © 2017 Unique Touch Concrete Design.